The very first incarnation of the Mac OS offered folders for organizing files. Not so for the first iteration of the iPhone. It took until June 2010 and the release of iOS 4 for folders to arrive on iOS devices. Whether your iPhone is sparsely loaded with Apple’s default apps, your app count totals in the hundreds, or you fall somewhere in between, iOS folders—despite a few limitations—provide a simple way to streamline your home screens. If you’re not familiar with folders, we run through the two methods for creating them and organizing them—one you can use directly on your iOS device and the other that you can manage through iTunes. We follow that up with a few folder tips and tricks. And don’t worry about whether iOS 5 will render all of this moot when it arrives this fall—from what we’ve seen of Apple’s forthcoming iOS update, the folders feature remains intact. One folder-creation approach involves using your iPhone (or iPad) directly. To create a folder, you need to drag one app on top of another. 1. Tap and hold on any app’s icon on your phone, until all the icons start to jiggle. 2. Once the icons are jiggling away, tap and drag one of the apps you’d like to tuck into a folder onto a second app. (Yes, if you mistakenly tap the X attached to a jiggling app’s icon, you would theoretically delete it. But don’t fret about a misplaced tap: iOS will prompt you first to make sure you really want to delete the app.) After you hold the first icon on top of the other one for a second or two, your new folder gets created. 3. 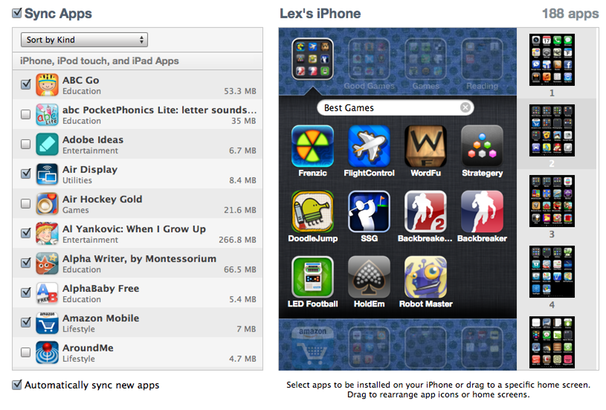 By default, iOS will attempt to name the new folder based on the genre of the apps you put into it. You’re free to change the name to anything you’d like, of course. Just tap in the text field with the name, and edit it as you desire. 4. At this point, your apps are still jiggling. If you want to add more apps to the new folder, tap outside the dark folder background, on any exposed area of your main home screen behind it. If you want to grab an app from another home screen, you can swipe over to that one, and then painstakingly drag it to the screen with the destination folder. To do that, drag the icon to the edge of your screen and hold it there until the device advances to the next screen. 5. When you’re finished filling up your new folder, tap the Home button to stop the jigging. If you want to move more than a handful of apps into folders, this process can be awkward and time consuming—particularly if you’re navigating across multiple home screens. Fortunately, you can also manage this process from within iTunes. 1. Connect your iOS device to your Mac, and click on its name in the iTunes sidebar—it will appear under Devices. 2. Click on the Apps tab. You can now click between home screens and drag apps onto each other (just as you would on the iPhone itself) to create folders. Though it’s far from obvious, you can actually use iTunes’s search box (at the upper right) to sift through your app list. That makes it much easier to find apps—which you can drag from the filtered list on the left side of the iTunes window—and place them into folders. 3. Again, just as on the iPhone, you can rename your folders from this screen, too. 4. Once you’re finished, click Sync to update your device. If you’re living a folder-free existence, you could be wondering why you should go through the effort to group apps together on your iOS device. We think that as you embrace folders, you’ll find all sorts of uses for them. For starters, you might choose to group together similarly-themed apps, like a folder of games or of text editors, freeing up screen space and ensuring that related apps are all in one easy-to-find place. You can also create folders to hide those apps you use less frequently—especially Apple’s bundled apps (like Stocks and Weather) that you can’t otherwise delete. You can also use folders to tuck away apps you use frequently, but whose home screen location you don’t feel like memorizing. That’s because, as with every other app, iOS apps in folders can be launched quickly via Spotlight, which lives to the left of your first home screen. And don’t forget—you can even put folders into your device’s Dock, to allow quick access to a full folder’s worth of apps from every home screen. One challenge you might encounter: Unlike folders on your Mac, folders on iOS devices can only hold a certain number of icons. iPhone folders are limited to 12 apps; iPad folders get a more generous 20. If you have 28 games to organize, then, the easy solution is to create multiple folders that can live side by side on your device. 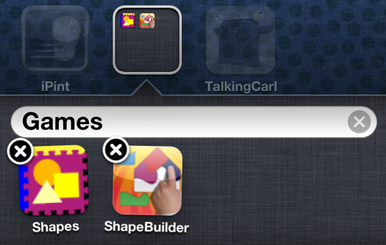 For example, my second iPhone home screen includes these three folders: Great Games, Good Games, and Games. Many iOS users content themselves to organize apps by using home screens. But if you’ve milked all the organizational structure you can by placing certain apps on certain screens—or worse, if your apps are just organized haphazardly—perhaps folders can introduce the stability and neatness your iPhone or iPad needs.